It is an irrefutable fact that nothing that happens at the beginning of April can cost a team an entire baseball season. That is, short of a disaster or otherwise some act of God. You know what there’s a lot left of? Regular-season baseball. There is so much regular-season baseball left to be played. Things are going to happen, and seasons are going to change course. At this point we’re practically still in extended spring training. But it is likewise an irrefutable fact that every single game of a regular season matters. Which is why we turn our attention to a game between the Rays and Rangers in Texas on Monday night. A year ago, the Rays finished within a few games of a playoff spot. The Rangers lost the division on the season’s last day, and then they were eliminated in the one-game wild-card playoff. The Rays and Rangers both project to contend in 2013. Things are going to be tight, most likely, making everything matter more, and on Monday, the Rangers closed out the Rays thanks to what we might charitably label a controversial call. Quick setup: it’s 5-4 Texas with two outs in the top of the ninth. Joe Nathan is pitching to Ben Zobrist with a runner on first, and Nathan gets to a full count. Evan Longoria’s on deck. Nathan throws a curveball and locks down career save No. 300. Way to go, Joe Nathan! Zobrist can’t believe it, and neither can Joe Maddon, who comes rushing out of the dugout. Neither, it seems, can Joe Nathan, though he manages to play it cool. A Rays opportunity goes by the wayside, and the Rangers improve to 5-2. It’s important to note, of course, that this call didn’t cost the Rays the game. It ended the game, but even if you give Zobrist a walk, the Rays’ win expectancy would’ve stood around 15%. It would’ve still been up to Longoria to deliver against a good and same-handed reliever, and maybe that’s where it all ends. Or maybe Longoria comes up with a big hit and the Rays complete the rally. This call cost the Rays a fraction of a win, which, in turn, costs the Rays a fraction of their playoff odds. That’s the big picture. This didn’t destroy the Rays’ season, but it dealt real damage. You can say that without overstating it. Watching that .gif, it’s almost inexplicable. Why that call? Why that delay in making that call? Visually, it seems like one of the worst calls I’ve ever seen, in a most unfortunate spot. Now we chip away. Let’s turn first to Brooks Baseball to examine the night’s strike zones. What do we find? That’s an exceptional strike call, to lefties. But look over to righties and you see that the Rays got a few generous calls, notably with Jose Molina behind the plate. This was not quite a tight zone, and two of those Rays strikes seem comparable to the final Rangers strike in terms of distance from the effective strike zone. It’s something, is all I’m saying. Would you look at that? There’s something of a hot spot right where Nathan’s curveball wound up. Make as much or as little of this as you want, but Foster’s made this call before, it looks like. It wasn’t unprecedented. A.J. Pierzynski made this pitch look worse. A.J. Pierzynski made this pitch look like it was practically in the dirt. In truth, it was a little off the outer edge, somewhere around the level of the knees. You remember that terrible call from the World Baseball Classic, where the pitch was made to look worse because it wasn’t received well? Yeah. You can see how a catcher’s pitch-receiving can be distracting, and you almost want to applaud Foster for making his call independent of Pierzynski’s actions. So there are explanations. Yet here’s the big problem: they aren’t good enough. They’re enough to keep this from being literally the worst strike call ever, in a high-leverage situation. But they aren’t good enough to keep this from being a really bad call anyway. I asked for some PITCHf/x help from Matthew Carruth, and he came through for me in the clutch, just like Ben Zobrist didn’t. Maybe I shouldn’t make that joke in this article. On the PITCHf/x axes, this final curveball was located around -1.4 horizontally, and 1.6 vertically. I asked Carruth to go to his database and spit out all pitches between -1.5 and -1.3 horizontally and 1.5 and 1.7 vertically. Selecting only for pitches thrown to left-handed batters, of course. There were nearly 3,000 such pitches taken, and 2% of them were called strikes. There were nearly 300 such curveballs taken, and 0.7% of them — two of them — were called strikes. There were 76 such full-count pitches taken, and 3.9% of them — three of them — were called strikes. 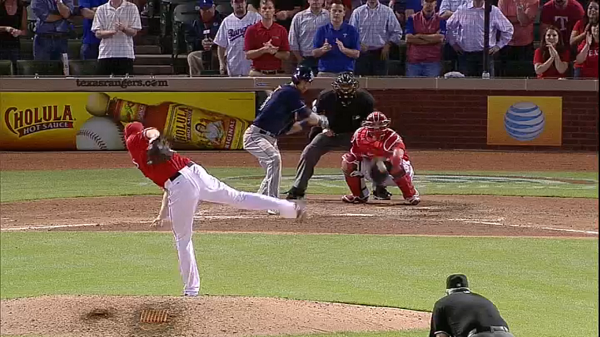 This call hadn’t never happened before in the PITCHf/x era, but almost every single time, this pitch has been a ball. 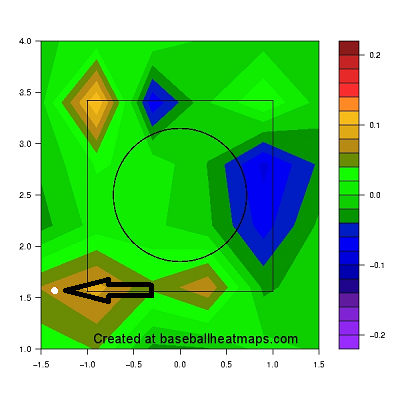 Which is the right judgment, because the pitch is not in the zone, and in the zone is where the strikes are, or are supposed to be. Marty Foster didn’t make the worst call ever. He just made a bad call, bad enough to be just about unforgivable. That’s probably too strong a word, since Marty Foster is human and calling pitches on or near the border is hard work. Foster can be forgiven. But like Joe Maddon said, this can’t happen in a major-league game, and certainly not at the very end of a game between two presumed playoff contenders. Calls like this take the game partially out of the players’ hands, and it’s the players we watch to see perform. When Foster reviewed the pitch on video, he recognized his error in judgment. By that point there was no going back, and in the heat of the moment, for whatever reason or reasons, Foster signaled strike when he absolutely should’ve signaled ball. The outcome of an at-bat and the outcome of a baseball game was determined. Given that calls like this are relatively infrequent, this isn’t a problem that’s out of control. But this is a problem that, under the game’s current system, we have no choice but to accept. Sometimes it’ll work in your favor. Other times, they’ll be other times. We hoped you liked reading Anatomy of a Really Bad Call by Jeff Sullivan! Wow, do umps often admit to mistakes the way Foster just did? Or is that a new thing? It’s happening more often now that we’ve got all this tech to verify blatantly bad calls. This kind of stuff does happen way too often. The game in which Samardzija was pitching he couldn’t buy a strike from the umpire. There were at least 6 strikes in his last two innings that were called balls. Including one on, I believe, a 1-1 pitch to Hudson, who would ultimately walk. And then crap fell apart. Samardzija didn’t help himself by becoming a maniacal blithering idiot when the calls weren’t going his way. The comments regarding anything happening more often were in reference to umps fessing up to making mistakes, not umps making more mistakes. When I’m watching a game with beer in hand, I get just as upset as the next fella, especially when each broadcast shows their own little FoxTrax (tm?) that always seems to be about 8″ off laterally — but every time I hop on brooksbaseball I’m amazed how consistent and accurate these guys are on calling 250+ plus pitches a night. With HD, blown calls seem like a much bigger deal nowadays, and the fact that we’ve got the technology to start fixing these issues but haven’t used it yet hurts, but the umps do a generally great job. I’d take the current state of MLB umpires over any other professional or high level referees in sports today. hoober27 has a great point — human error happens, but in general I think MLB Umpires are among the best in sports. They should be the best officials in sports. Every other sport requires referees to make calls while both they and the players are moving, that’s not an easy thing. In baseball, you stand still and the ball comes right at you, or you’re dialed in to watching one bag/the line. Now that’s not to say that those baseballs don’t move fast, sure they do, but there is a crew of guys there to get it right. The fact that MLB games are still affected by human error is pathetic. Gallaraga’s perfect game is a good example and Jim Joyce is one of the best umps in the majors. In this game, it’s likely that the Rangers still win and Nathan gets Longo out, but for the game to end on a garbage call is really lame. But that’s exactly the problem. Umpires should be impartial. And yet, they’re human. It’s inevitable that their calls will be biased by emotion and by their feelings of a player. Doesn’t seem good for the game. Their job may be more difficult in some ways, the speed and precision required is certainly the highest, it’s easier in others, namely that there are very few judgement calls that make up the majority of calls for many contact sports. The difficulty is irrelevant anyway, the majority of an umpires calls (balls and strikes, safe and out, fair and foul) are more easily performed using technology than other sports. Just as I’m not watching to see the umpire call the game, I’m not there to marvel at how difficult their job is or how proud they should be of themselves that they get 85% of the balls and strikes right. I’d take NFL or NHL refs over MLB umps anyday but that’s also a function of the leagues’ (and the officials’) willingness to get calls right rather than uphold tradition and stroke the officials. Soccer has a big problem in that refs need to make very difficult judgement calls (like most contact sports) that can of course be aided by replay, but the flow of the game is much more prohibitive than the major sports in NA. With an extra umpire or even extra umpiring crew reviewing video in a booth and relaying information to the home plate umpire using a phone behind the plate, or even via headset, (having all of them gather and run off the field is a stupid waste of time) would have little effect on the flow of the game, and shouldn’t increase game length if they make an effort to reduce wasteful delays that are currently tolerated (too many timeouts at the plate, excessive time between pitches for the hitter or pitcher to set, manager confrontations with the umpire). I’d take NFL or NHL refs over MLB umps any day but that’s also a function of the leagues’ (and the officials’) willingness to get calls right rather than uphold tradition and stroke the officials. Soccer has a big problem in that refs need to make very difficult judgement calls (like most contact sports) that can of course be aided by replay, but the flow of the game is much more prohibitive than the major sports in NA. With an extra umpire or even extra umpiring crew reviewing video in a booth and relaying information to the home plate umpire using a phone behind the plate, or even via headset, (having all of them gather and run off the field is a stupid waste of time) would have little effect on the flow of the game, and shouldn’t increase game length if they make an effort to reduce wasteful delays that are currently tolerated (too many timeouts at the plate, excessive time between pitches for the hitter or pitcher to set, manager confrontations with the umpire). I also think there’s something to umpire consistency. No question this was a bad call, but in life, and baseball, there will be mistakes. Some umps have historically wider strike zones than others–captured in this year’s Bill James book–but I digress: do we really want to have technology take-over the flow of the game? I’m worried that video playbacks will slow the game down and change the strategy of how players approach pitchers. A box, with a light. That’s all it would take to do this right. If this were anything but recreational past time the umpire standing behind the catcher to judge where the ball crosses the plate would have been automated decades ago. We can know the actual fact without must effort or cost. Why still guess? It’s an extremely cushy job with great pay and tons of time off, and yet not a single umpire has been fired in the last 25 years. Did you not see Galarraga’s perfect game? My thoughts exactly. Did Joyce set an odd precedent that it’s ok to admit your mistake as long as you realize you were wrong?? Still, major props to him for actually having the stones to do it. Most umpires would’ve never taken the question or would have run off some BS about something or other and “their strike zone” and “consistency” or something else ridiculous. It doesn’t change the call but he should be commended for admitting the mistake. Hopefully he won’t make it again, particularly in such a high leverage situation. Major stones? Maybe. Or maybe it’s just him recognizing that MLB won’t take any corrective action. It’s pretty easy to admit to your mistakes when there’s nothing personal at stake. I’d sit the guy out a game for that (If that’s even allowed under their labor agreement). Do you get suspended from your job every time you make a mistake? Or does your labor agreement not allow that?